A motorcycle is a good investment you want to keep looking as good as new. Some may opt to give it a new splash of paint to retain that new look. But wait for a second, this might be a costly undertaking on the long run. 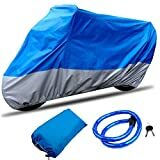 A more budget-friendly option to protecting the new look of your bike is with the motorcycle covers. This one-time purchase keeps your bike protected from weather elements and scratches. 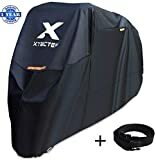 The number of options for motorcycle covers is far too wide. From design, size, to material, there’s a lot of consideration to keep in mind in order to choose the right motorcycles cover. Don’t know where to start looking from? 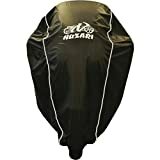 Well, let’s save you time by giving a list of the best motorcycle covers that provide a level of protection you’ll like. This cover gives a universal fit for most standard and off-road bikes up to 108 inches. The cover is made of 180T polyester taffeta fabric coated with PU material. The result is a durable and lightweight cover that’s resistant to abrasion and mildew attack. It keeps off rain and damaging UV rays by providing a top to bottom coverage. Lock holes and buckles keep it secure to prevent being blown away by the wind. This super soft cover comes with a storage bag so you can use it anywhere. 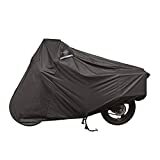 The 97-inch fit provided by this motorcycle cover makes a good match for cruisers and touring bikes. It’s a large, high-performance cover that has a perfect combination of durability and style. The cover is made of tough 300D polyester fabric. High-tech waterproofing and wind shelter make this cover virtually weatherproof. Hidden grommets keep it secure even in windy conditions. The breathable, double-venting system prevents condensation and mildew. There are hidden pockets for storage purposes. 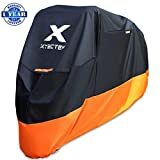 XYZCTEM cover is an all-weather motorcycle cover designed to fit with great precision. It gives 100-inch fit designed for tour bikes, cruisers, and choppers. The nylon oxford material gives improved weather protection. The fabric is breathable to eliminate condensation from the seat area. This cover has good non-abrasive properties that are gentle on the paint of your bike. A double stitch design lets it hold up well even in the toughest weather. 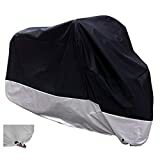 This motorcycle cover is made of high-grade polyester designed to take a beating in any kind of weather. It’s a medium-sized cover that’s tough on the elements yet gentle on the paint and finish of your bike. Built-in vents are fitted on the corners for improved evaporation. That means no condensation or mildew issues to deal with. A reinforced elastic hem gives a custom fit and prevents the cover from being blown away by the wind. This cover has an adjustable strap to accommodate large motorcycles. 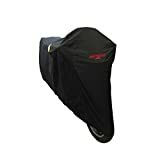 This is an extra-large motorcycle cover designed to fit up to 114-inch bikes. In fact, it fits 99-percent on and off-road bikes. The cover is made of a heavy-duty oxford fabric and provides a top to the bottom cover to keep out weather elements. Lock holes and buckles keep it securely attached to the bike to protect against wind. The fabric is well ventilated to prevent condensation that might lead to cracking of the seat. This cover gives that perfect fit to 99-percent of on and off-road bikes. It’s designed to fit up to 116-inch bikes. The material used on this cover is 180T polyester finished in a weatherproof coating. The great size of this cover means you get a complete top to bottom coverage for improved protection against weather. Lock holes and a buckle system anchors the cover in place so it doesn’t get blown away by the wind. The cover comes with a bag for easy storage and transportation. 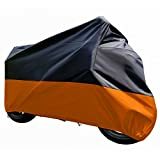 Tokept Black and Orange cover give a perfect fit for bikes up to 116 inches. The cover is made of 190T oxford fabric that has a unique waterproofing layer. This cover sits sleek with an elegant appearance. Condensation is prevented with a good ventilation system. A bag is included to make it easier to store and transport. 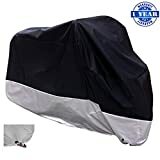 This is a stylish motorcycle cover with some elegance to match. The cover provides a universal fit for bikes up to 96 inches. It has a high elastic band around the bottom to give you an easy time putting on and removing when not in use. Your bike is kept secure with lock holes and an advanced buckle closure system. Well, this cover is made of high-density 190T polyester for improved resistance against inclement weather. The medium size of this cover makes a perfect match for bikes in the range of 250cc to 750cc. These include sport, street, and small cruiser bikes. The cover is made of 210T polyester with a high-tech waterproof coating. The cover is gentle on your bike to prevent any form of scratches. Heat resistant panels give a good level of ventilation to keep off condensation. A compression bag gives a portable and compact storage for easy use wherever you are. This is a heavy-duty everyday option for outdoor use. The cover is made of tough, breathable 300D polyester fabric resistant to weather and condensation. A waterproof design is achieved via double taped seams. Soft cotton is used underneath the cover to protect your bike against scratches. An elastic cord fits along the bottom perimeter of the cover to provides a snug fit. The cover has hidden pockets where you can keep bike alarms.